Imagine the scene; we’re in LA, there’s a 1950s greaser, a vampire, some electro pop playing and everyone’s speaking in Iranian. Oh, and it’s black and white. The aforementioned might be particularly tricky to fathom in any tangible context, unless of course you’re off your head on drugs, or just film director Ana Lily Amirpour. The American-Iranian director has delved into her wildest dreams, or nightmares, to create a memorable debut that echoes David Lynch, Spaghetti Westerns, classic horror, 50s Americana, Sin City and Paris, Texas. Set in a barren underworld of urban decay, aptly labelled ‘Bad City’, A Girl Walks Home Alone at Night follows the entwined paths of the city’s nocturnal outcasts. Amongst those whose lives fortuitously cross are rocker Arash (Arash Marandi), pimp Saeed (Dominic Rains), prostitute Atti (Mozhan Marnò) and an innocuous vampire anonymously labelled ‘The Girl’ (Sheila Vand).The closest thing to a central narrative is a stoic, fate driven love story between Arash and ‘The Girl’. Beyond this flimsy focal point there are flashes of further stories as characters are tragically projected in down-on-your-luck, social realist fashion. Narratively it’s all a bit clichéd and obligatory. It feels like Amirpour has had this fantastic idea for a time, place and atmosphere but can’t think of anyone particularly new, novel or interesting to populate it with. Sure, there’s a vampire which seems bold, but the blood suckers have already pervaded every essence of popular culture dampening their bite here. The narrative may be emaciated, but the artistic direction and atmosphere is full bodied, pumping with life. The film does a fantastic job of creating a distinct world that’s both eerily familiar and utterly new. This strange nowhere place is characterised by contradictions. Everyone is Iranian in appearance and voice but the surroundings are unquestionably American. Light permeates the darkness in unashamedly noir fashion, yet the icy stares and lawless lands resemble a western. Everything points to the film being in the 21st Century, but then Arash’s 1950s motor and Marlon Brando inspired demeanour appear. On top of these vexing paradoxes is the intrinsic mystery of filming in black and white. The most obvious cinematic comparison to this dark timeless setting is David Lynch’s industrial hell in Eraserhead, never more so than when camera pans to the stark outer city oil fields. Cinematographer Lyle Vincent cleverly utilises the black and white contrast to create an unsettling paranoia. He consistently sets up scenes like an eye slowly adjusting to the dark by easing the focus through the depth of field. While the technique is overused, it comes into its own when ‘The Girl’ stalks her prey hauntingly in the background, her menace unseen until it’s too late. Another overarching influence seems to be Nicolas Winding Refn. A Girl Walks Home Alone at Night’s synth pop infused soundtrack plays a commanding role in a very similar vein to Refn’s Drive. Similarly, the stoic tableau-esq compositions are strongly reminiscent of Only God Forgives which revelled in its reserved beauty. Certainly the calm, calculated characters exude the same sort of emotional restraint as God Forgives. These approaches combine beautifully when Arash and ‘The Girl’ close in on their intimacy. White Lies’ track ‘Death’ plays out in its entirety as the two deliberately coalesce under the sparkle of a disco ball. He’s dressed as Dracula, she’s a vampire and there’s an ambiguous threat as to whether they’ll embrace or devour one another. It’s a mesmerising spectacle that fully submerges the viewer in the film’s peculiar trance. 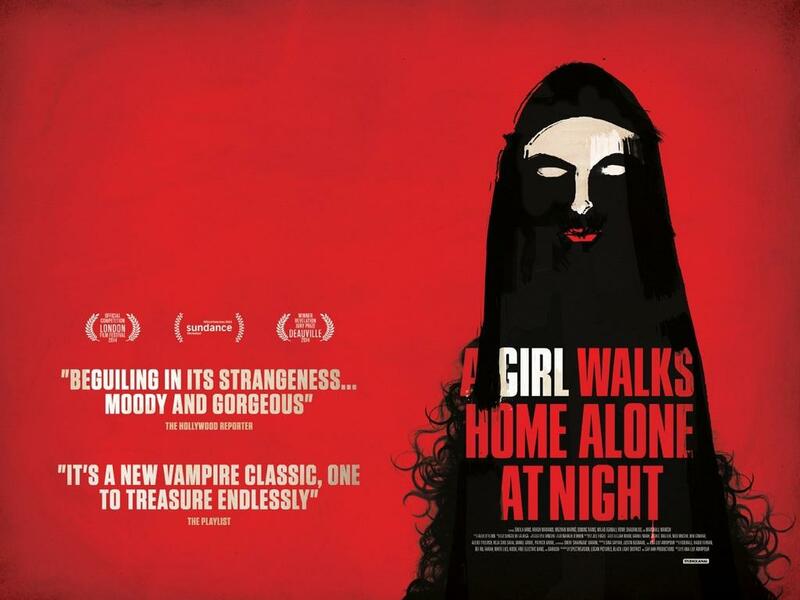 A Girl Walks Home Alone at Night is very much a classic case of style over substance. It’s very difficult to extrapolate anything valuable thematically from the film. Amirpou seems quite happy to use the film as a way of unloading her exhaustive source of personal influences into the world, not in a dissimilar way to Kenneth Anger’s seminal cinematic collage Scorpio Rising. There’s an underlying feminist agenda as the female characters outshine their morally dubious male co-stars. It’s far from a concreate thematic direction, but it’s the closest the film gets to one. As the double rarity of being female and Iranian it’s hardly surprising to see Amirpou championing the cause, it’s just a shame that the statement is lost in the miasma of genres. 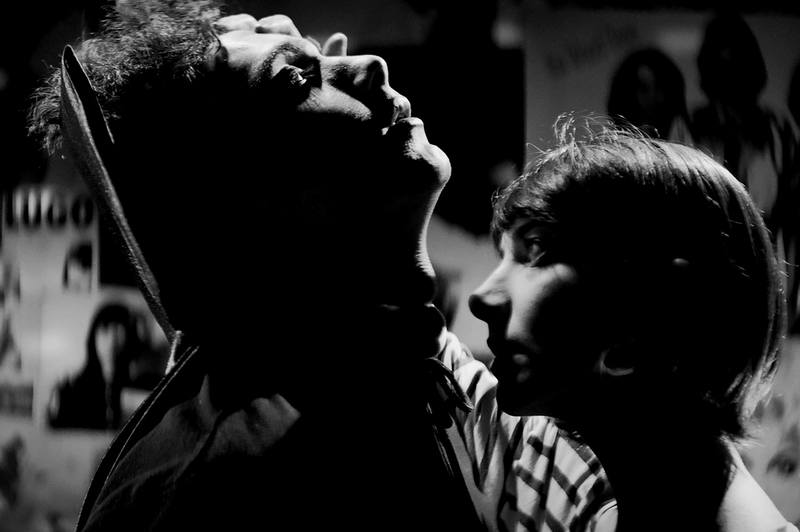 A Girl Walks Home Alone at Night could easily become a cult classic in the near future. The sheer peculiarity of its juxtaposition is more than enough to lure in viewers from the darkest corners. There’s nothing juicy to sink your fangs into, but there’s an irresistible air of cool that Amirpou effortlessly creates. The film in a roundabout way is like an offbeat homage to the great antiheroes of the 1950s and 60s. James Dean, Marlon Brando and Clint Eastwood defiant personas live in Arash’s nonchalant stares throughout. However, the fascinating vision is in need of a compelling narrative to anchor its murky voyage. Amirpou’s eye catching debut heralds an auteur in the making. Her next feature, The Bad Batch, is billed as a dystopian tale of love and cannibalism set in Texas. It sounds fascinating, and if she can weave a gripping story amongst the stylish regurgitations then she could be on to something truly brilliant. 7/10- Middle Eastern Feminist Vampire Romance. That’s a new one.